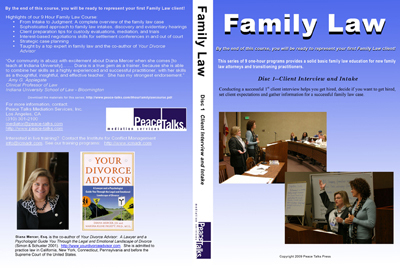 By the end of this course, you will be ready to represent your first Family Law client! This series of 9 one-hour programs provides a solid basic family law education for new family law attorneys and transitioning practitioners. Description: Conducting a successful 1st client interview helps you get hired, decide if you want to get hired, set client expectations and gather information for a successful family law case. Description: Thorough and ethical preparation of your client for a court-ordered custody mediation and evaluation can mean the difference between success and failure in a contested custody matter. Discovery in family law goes well beyond the required court forms.Learning to read tax returns, pay stubs, and other financial documents can help you discover undisclosed income and assets. Learn where and how to find the information you’ll need to advise your client, settle, and try a case. You’ll lose very few family law cases if you’re well prepared. Learn what and how to prepare a family law case, and client, for an evidentiary hearing. Since over 95% of all family law cases settle before trial, effective negotiation and settlement skills are essential to successful family law practice. Learn how to get the upper hand in negotiations and settlement meetings for favorable resolutions for your family law cases. You’ll lose very few family law cases if you’re prepared. Many cases settle at the pretrial conference stage, so being well-prepared can mean the difference between an acceptable settlement conference and a successful recommendation from the settlement officer. Your client’s parenting plan needs to serve the children’s best interests as well as work for the parents. A detailed plan based on the children’s ages and bonds with the parents will have the best chance of being adopted by the court as well as insuring a successful post-divorce co-parenting relationship. Family law is a minefield of potential malpractice and unintended consequences.Drafting a tight judgment will avoid problems later while giving your client a clear roadmap of everyone’s rights and responsibilities.